Today marks 20 years since Disney's famous film, Mulan, was released in cinemas. I actually came to Mulan rather late, having missed out on the film as a child, and watched it for the first time just two years ago. There have been many arguments over the years about what Disney's most feminist film is, but it is undebatable that Mulan paved the way for future Disney heroines like Merida, Rapunzel, Tiana, Elsa and Moana to continue breaking glass ceilings. And it is still, 20 years on, a really important film for young girls. First off, it's important to note that Mulan is not technically a princess. She's part of the Disney franchise of Princesses, but she does not have any royal blood, nor does she marry a prince. Mulan is, at least at the start of her movie, an ordinary Chinese woman. This might seem like a strange thing to point out, but it's actually one of the things that make her such a good role model for young girls even 20 years on. She demonstrates that you don't have to be a princess to change the world, and that being a princess is not the only thing that women have to aspire to be; you can aspire to be a warrior instead, and that's just as awesome. Mulan's story doesn't revolve around her romance, but rather her romance with Shang is somewhat of an afterthought. Her goal throughout the entire story is protecting her family (the whole reason she joins the army in the first place is to make sure her elderly father doesn't have to fight) and her country, and falling for Shang is just something that happens along the way. The achievement in this film is not falling in love with Shang, it's saving China. 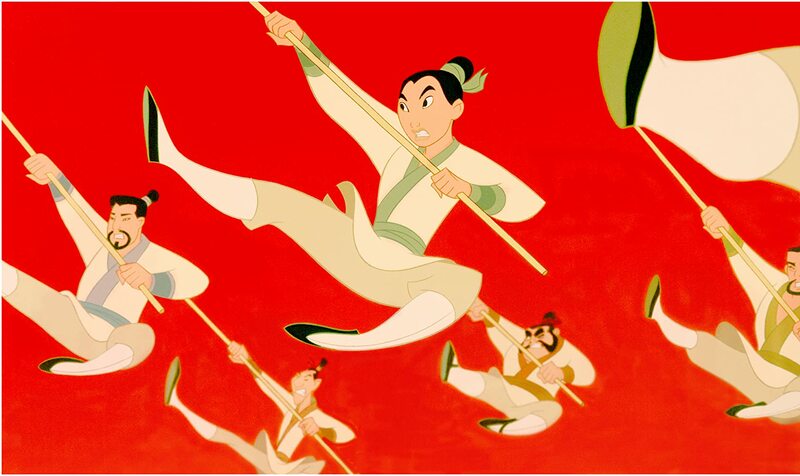 Mulan challenges gender stereotypes, as she proves (albeit whilst all the other characters think she is a man) that women are strong and capable. Most pointedly however, when she saves China, she does so as a woman. In the film's climactic fight scene, where Mulan is fighting Shan Yu, she does so as herself, not dressed in armour, or in the costume she is made to wear by the matchmaker at the beginning of the movie: she embraces both parts of her identity, as a woman and as a soldier. Mulan is able to use her feminity to her advantage, and in one of the most iconic scenes of the film, Mulan and her fellow soldiers manage to ambush the huns by dressing up in geisha dress. This shows her not only embracing feminity but using it as an asset. The fact that the tongue in cheek, "I'll Make A Man Out of You" is reprised in instrumental in this scene is also important because it is a background to Mulan using her feminine qualities to espouse all the things that the song supposedly says "makes a man". In the end, Mulan rejects the job offered to her by the Emperor, in favour of going home to her family, bringing the film full circle and ending with Mulan doing what she had always intended to do; make her family proud. When Mulan returns home, she is told by her father that he was "never prouder to have [her] as a daughter"; she had achieved her goal and brought honour to her family, all whilst discovering and embracing her own identity. Disney has put out a spate of other feminist films since then, with The Princess and The Frog, Tangled, Frozen, Brave and Moana, but it was Mulan who paved the way for them. Mulan shows young girls that girls can be strong, and brave and smart and powerful, that romance doesn't have to be your only goal, and that it's okay not to fit in to the moulds society lays out for you. And for that, twenty years on, Mulan is more relevant than ever, as a whole new generation of children get the chance to discover a Disney heroine who is not a princess, but an ordinary woman who does extraordinary things, a message frankly just as relevant now as it was in 1998.